Can you identify any of the unidentified people in this photo? 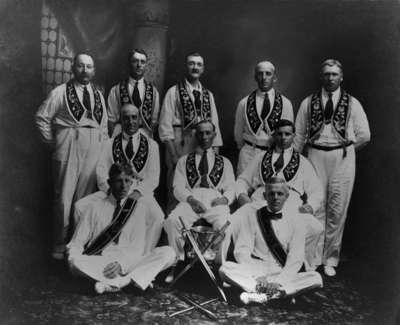 A black and white photograph of members of the Eastern Star Lodge No. 72, I.O.O.F. (Independent Order of Odd Fellows). This picture shows members of the Oddfellows Lodge (not necessarily the officers) seated with a silver cup and two sets of crossed swords. The significance of this picture is not known. Back Row: Jim Hallett; unidentified man; unidentified man; Robert Deverell; Richard McMillan. Middle Row: Ernest MacMillan "Mac"Deverell; unidentified man; Art Hopper. Oddfellows Hall was built in 1873-1875 on the east side of Brock Street north of Dundas Street and demolished in 1964. Members of the Eastern Star Lodge No. 72, I.O.O.F., c.1906, George I. Wilson. Whitby Archives 18-006-002.